Plants use sunlight not only as an energy source for photosynthesis but also as an informational cue to control a broad range of developmental and physiological responses throughout their life cycle (Franklin et al. 2005; Kami et al. 2010). These responses include seed germination, de-etiolation, directional growth, organelle movement, flowering, and senescence that are mediated by various cellular responses such as gene expression, protein modification etc. Plants have evolved unique photoreceptor systems to mediate the light responses in response to broad wavelengths from ultraviolet-B (UV-B) to far-red light. In plants, many types of photoreceptors have been identified (Fig. 1): phytochrome (phy), and cryptochrome (cry) and phototropin (phot) are known as major red/far-red and blue light receptors, respectively. Photoreceptors have photoreceptive domains binding chromophores to absorb light signals: cGMP-specific phosphodiesterases, adenylyl cyclases and FhlA (GAF) of phy, photolyase homologous region (PHR) of cry, and LOV (light, oxygen, or voltage) of phot bind tetrapyrrole and flavins as their chromophores, respectively (Burgie et al. 2014; Christie et al. 2014). Photochemical reactions on the chromophore lead to conformational changes of the domain and regulate output domains. Thus the photoreceptor converts the physical light signal to a biochemical signal, such as protein–protein interactions and enzyme activation, and then the light signal is propagated downstream. In Arabidopsis, phy mediates regulation of transcription by forming a complex with a family of phytochrome–interacting factor (PIF) in a red/far-red light dependent manner. Phys are involved in germination, de-etiolation, shade-avoidance responses and so on. Recently, it was identified that phy also regulates alternative splicing (Shikata et al. 2014). Cry also regulates transcription and mediates various blue light responses including inhibition of hypocotyl elongation, photoperiodic control of floral initiation, circadian rhythms, etc. (Christie et al. 2014). Phot is a blue light-dependent ser/thr kinase and triggers the phospho-signaling pathway. Phot mediates differential cell growth in the phototropic response via biased auxin distribution, chloroplast photorelocation movement, stomatal opening, and leaf flattening, all of which are necessary to optimize photosynthetic ability (Christie et al. 2014). ZEITLUPE (ZTL), FLAVIN-BINDING, KELCH REPEAT, F-BOX1 (FKF1) and LOV KELCH PROTEIN2 (LKP2) group proteins are blue light sensors that have LOV, F-box and Kelch-repeat domains and form signaling complexes with factors involved in the regulation of the circadian clock and photoperiodic flowering (Zoltowski and Imaizumi 2014). UV RESISTANCE LOCUS8 (UVR8) is a UV-B light receptor recently identified which uses tryptophan residues as a chromophore (Jenkins 2014). UV-B absorption induces structural change from a homodimer to two active monomers, which leads to a crucial interaction with CONSTITUTIVELY PHOTOMORPHOGENIC1 (COP1), acclimation and UV-B tolerance, and hypocotyl growth inhibition (Jenkins 2014). UVR8 also induces changes in gene expression for UV-protection. In addition, a chimeric photoreceptor kinase, neochrome, which has both GAF and LOV domains, acts as a red/far-red and a blue light sensor for phototropic response and chloroplast movement in Adiantum capillus-veneris (Kawai et al. 2003; Nozue et al. 1998). In algae, not only major photoreceptors such as phy, cry, phot but also aureochrome (aureo) and opsin were identified by recent genomic studies (Kianianmomeni and Hallmann 2014). The molecular and genetic studies of Arabidopsis have provided significant advances in our knowledge of light responses. In addition to the discovery of photoreceptors, many signaling factors that are involved in downstream pathways for light responses have also been broadly identified from algae to higher plants (Kami et al. 2010; Kianianmomeni and Hallmann 2014). From the accumulation of knowledge of light signaling in Arabidopsis, detailed mechanisms for light signaling have been discovered. The photoreceptors mediate various downstream signaling independently. Some signaling proteins correlate with each other so that many responses are redundantly regulated by different photoreceptors. Crosstalk in signaling pathways downstream of phy and cry are found in de-etiolation and flowering (Endo et al. 2016; Pedmale et al. 2016). A complicated network of light signaling from each photoreceptor evolved enabling a response against changes in light environment. Plant photobiology has been receiving attention for long time from plant biologists. The molecular mechanisms underlying light perception and the downstream signaling pathways that regulate diverse physiological responses have been intensively challenged for several decades. This research field is still prosperous and technical advances in genomics, biology, biochemistry, and biophysics have shed light on the knowledge of molecular mechanisms. However, the overall signaling mechanism remains undiscovered in many fields. We thus aim to share the latest data and knowledge, revisit light signaling discoveries and identify future goals at this JPR symposium. In this issue of JPR symposium entitled “The cutting edge of photoresponse mechanisms: photoreceptor and signaling mechanism”, we present six reviews and two original papers covering a broad range of research topics from photoperception to light responses. The articles discuss evolution of photoreceptors, the diverse functions and properties of plant photoreceptors and signaling mechanisms. In this JPR symposium issue, we also emphasize the diversity of photoresponses in algae with unique light responses compared to higher plants. The following includes brief introductions of these reviews and articles. Technical advances in genomic analyses have recently provided deep insights into the genetic analysis of light signal transduction. The diversity and evolution of photoreceptor gene families in photosynthetic eukaryotes were well defined (Li et al. 2014, 2015a, b). In this issue, Li and Mathews (2016) reviewed their recent results about the molecular evolution of three photoreceptors, phy, phot and neo by focusing on domain constructions. Analyses of photoresponses at the molecular level are necessary to understand complete mechanisms for light signaling in plants. Elucidating structural and molecular aspects of photoreceptors in light perception is necessary in understanding light sensing and downstream signal transduction. Recent genomic analysis suggested that the phytochrome gene families are widely found not only in higher plants but also in cyanobacteria. Intensive structural analysis of phytochrome was carried out to understand conformational changes induced by photoperception (Anders and Essen 2015). Nagano (2016) reviewed molecular structures of prokaryotic and plant phytochromes and discussed their functional universality and diversity by the comparison of prokaryotic and eukaryotic phytochromes. Liu et al. (2016) reviewed the molecular mechanisms underlying cry signaling in Arabidopsis that cover the photoreaction mechanisms of FAD (flavin-adenine-di-nucleotide) and the Trp-triad, phosphorylation of cry C-terminal extension and signaling complex with several signaling factors. They nicely summarized the differences in cry1 and cry2 signaling complexes and their signal cascades. Okajima (2016) reviewed recent studies of the intra-molecular mechanisms of phototropin of Arabidopsis and Chlamydomonas. The relationship between LOV domain photocycle and its regulation of the ser/thr kinase activity, the structural model and light-induced structural changes are summarized. The signaling mechanisms from light perception to cellular responses have recently been revealed in detail in phototropin-mediated responses. Interestingly, distinct phospho-signaling pathways that are triggered by phot1 and phot2 are used for phototropism, chloroplast movement and stomatal opening, respectively. Kong and Wada (2016) reviewed the molecular basis of chloroplast photorelocation movement that is redundantly mediated by phot1 and phot2 in response to blue light. They emphasized dynamic reorganizations of cp-actin filaments and technical advances in the exploration of the molecular mechanism. BLUS1 is a protein kinase functioning downstream of blue light-induced stomatal opening as a phot1 substrate (Takemiya et al. 2013). In this issue, Takemiya and Shimazaki (2016) reported, as an extension of the previous study, that BLUS1 was also phosphorylated by phot2 and the extent of BLUS1 phosphorylation could be regulated distinctly by phot1 and phot2. Ishishita et al. 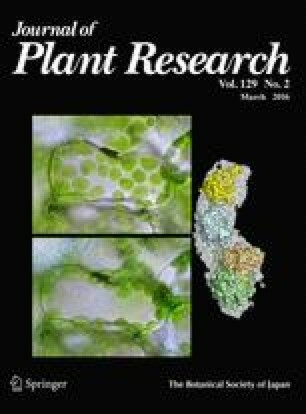 (2016) reported that two phototropins genes, PHOT1 and PHOT2, the orthologues of Arabidopsis thaliana were encoded in the genome of Welwitschia mirabilis Hook. f. Wmphot1 complemented the deficient mutant phenotypes of Atphot1 in transgenic Arabidopsis plants. They claimed that W. mirabilis possesses typical phot-mediated blue light responses that are mediated by functional phot1. Takahashi (2016) reviewed a different type of photoreceptor, aureo, originally found in Vaucheria, focusing on the physiological functions and structural properties. Aureo possesses a bZIP-LOV domain and functions as a transcription factor in the nucleus. Algae have evolved various types of photoreceptors with a common photosensory domain and distinct output domains (Kianianmomeni and Hallmann 2014). A great deal of attention is being paying to algal photoreceptors as genetic sources for the development of functional proteins in optogenetics (Beyer et al. 2015). However, it is also important to discover the regulatory mechanisms of aureo. Here, we propose that one of our next goals is to explore spatiotemporal expansion from the light responses to the signal transductions. We hope that this JPR symposium issue, together with the other excellent papers cited in the reference, will prove to be interesting, informative, and useful in understanding current knowledge and further exploration of this research field. The authors gratefully acknowledge all authors on their nice contributions. We also thank Dr. Ikuo Nishida for his kind suggestion for this JPR symposium and Mr. Adam Gomez for his critical editing of this manuscript.